Straightening curly hair requires damaging heated straighteners -- or so you thought. There are other ways to straighten your locks without a flat iron so you can give your hair a break from the heat once in a while. Alternative techniques help to relax the curl out of your hair and provide a similar smoothness to that from a straightener, but you still may need to keep a flat iron on hand for bad hair days. Cleanse your hair with a straightening shampoo. These work by prepping the strands for smoothness post-shower. If you're looking to battle frizz-causing humidity, look for shampoos that contain cetyl or stearyl alcohol. Pick the right conditioner. To stimulate sleek hair, choose the matching conditioner for the straightening shampoo; if your hair is heat damaged, you may need a repairing conditioner. Vitamin and protein-rich versions act as a barrier against further damage, while also repairing dry, brittle tresses. "Oprah" magazine recommends using repair conditioners for one to two weeks at a time. Towel-dry your hair with a microfiber towel. If you choose to use a blow-dryer, you still need to make sure your hair is damp and not wet before beginning the process. Microfiber towels don't strip and damage the hair cuticle like ordinary cotton towels can. Detangle your hair with a wide-tooth comb. This type of comb prepares your hair for styling without damaging your strands along the way. Apply straightening cream or gel, using only a dime-size amount. Rub the product between your hands and apply with your fingertips, starting at the scalp and working your way down the rest of your hair. Straightening creams tend to have less hold, but more moisture than their gel counterparts. Distribute the product through your hair with a large wide-tooth comb. Blow-dry your hair. This can offer the same effects as a flat iron but with a little less damage. 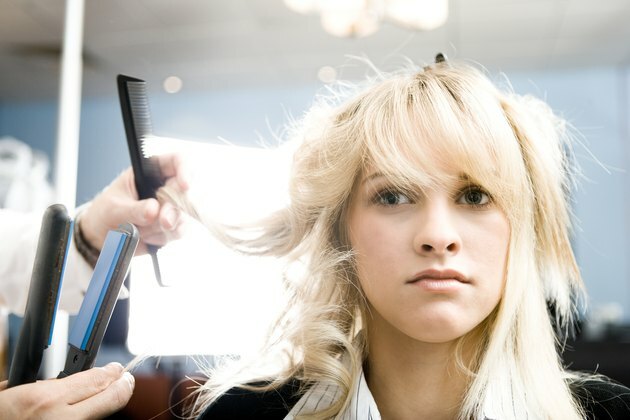 Use a paddle brush or a round bristle brush; pull small sections of hair in a straight-out motion while blow-drying. Make sure your dryer is at least 1875 watts. Try a few different products until you get the desired amount of straightness. Remember that no product will completely straighten curls on its own. Never use flat irons on wet hair.